Carpal Tunnel is a narrow and quite rigid passageway on the palm side of the wrist composed of bones and ligaments that protect the median nerve and nine flexor tendons as they travel through the wrist to the hand and fingers. When the nerve becomes compressed in the tunnel we speak of Carpal Tunnel Syndrome (CTS). CTS is a very common peripheral compressive neuropathy caused by increased pressure within Carpal Tunnel. 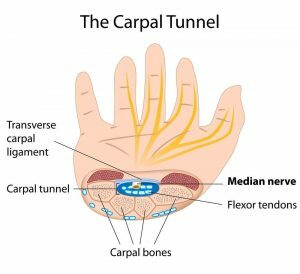 This can occur when the tunnel becomes narrowed or when synovium surrounding and lubricating the tendons swells and reduces the space in the carpal tunnel, crowding the structures within and putting pressure on the median nerve. As a result neural blood flow of the nerve becomes compromised which triggers an inflammatory response. Over time, this causes damage of the myelin sheath surrounding the median nerve, causing disturbed signal conduction and nerve function. Prolonged, chronic compression of the nerve results in further nerve damage and worsening of the symptoms the patient experiences. Therefore, early diagnosis and treatment are very important to prevent permanent damage and avoid surgical interventions. Weakness in the hand and loss of motor function. As the nerve compression continues, nerve damage and muscle weakness occurs leading to clumsiness, difficulty holding or grasping things, buttoning clothes etc. 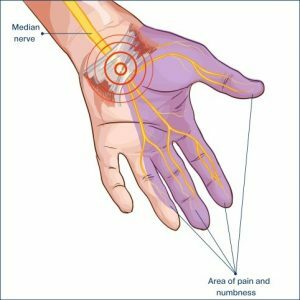 Pain at night due to wrist/hand positioning, e.g. sleeping with the wrist bent. Increased pain during activities that require prolonged wrist flexion or extension, such as: driving or using a phone. Repetitive movements of hand and wrist for prolonged periods of time. Traumatic injuries to hand and wrist (e.g. fractures, dislocations). Lesions, ganglions and bone spurs that reduce the space within the carpal tunnel. Health conditions such as: infections, hypothyroidism, renal disease, diabetes, rheumatoid arthritis, lupus can be associated with CTS. Hormonal changes alter the fluid balance in the body causing swelling. Gender and Age. Studies show that women between the ages 49 and 60 are more likely to develop CTS. Sorry ladies! It is crucial to determine the etiology of CTS as it will influence the choice of best treatment option. Here at Mobilise we understand that everyone is different and no carpal tunnel is the same. We not only treat the symptoms of CTS but get to the bottom of the problem to get long lasting treatment results for our patients. Our thorough history taking and wide knowledge of orthopaedic testing always precedes the recommendation of the best course of treatment, further testing and rehabilitation. There are several treatment options available for Carpal Tunnel Syndrome ranging from non-invasive to surgical management of the condition. Left untreated, CTS will most likely worsen over time. Early diagnosis and the right treatment can slow or even stop the progression of CTS and relieve the symptoms. Rest and Splinting – to keep the wrist in a neutral position and reduce the pressure on the Median Nerve. Non-Steroidal (NSAID) – to decreasee pain and inflammation. Change and/or modification of activities that aggravate CTS symptoms. Soft tissue release (forearm, hand), joint mobilisations and nerve gliding (neural flossing). Cortisone injections – to reduce inflammation and swelling in the carpal tunnel. If non-surgical treatment was not successful and CTS symptoms persist or worsen, surgery may be recommended by a doctor. The surgical procedure is called “carpal tunnel release” and can be done via the traditional open procedure or endoscopically. Its aim is to increase the size of the tunnel and reduce the pressure on the median nerve and tendons. Complete recovery after operative management of CTS varies from case to case and may take up to a year. Give our Toowong clinic a call today to talk to one of our experienced Myotherapists for more information on how we can help if you are experiencing the symptoms of Carpal Tunnel Syndrome: 0473 090 442 or book online today. Magee DJ, Zachazewski JE, Quillen WS 2009, Pathology And Intervention In Musculoskeletal Rehabilitation, pp. 300-303. Brukner, P, Khan, K 2006, Clinical Sports Medicine, p. 325.